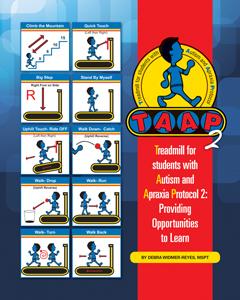 TAAP, Treadmill for students with Autism and Apraxia Protocol, published in 2009 was written to share an effective therapy program to help children learn. Children who receive Physical Therapy services in schools to support their educational programs face limitations. Effective programs face barriers of time, priority, space, equipment and peer engagement. TAAP is a visual-gross motor developmental program that expands expertise to the educational team, Paraprofessionals and families. The program can be performed for 10-minute intervals daily. A treadmill implies smaller space and can be easily moved. Non-therapists can easily follow the program precisely. TAAP 2, Providing Opportunities to Learn continues the explanations from TAAP. Students improve posture and gross motor skills that lead to enhanced fitness with engagement in recess, PE and recreational sports. Improved visual processing skills promote attention, regulation and organization, eye-hand coordination, imitation, and independence. Students completing performance modules using TAAP have documented increase in sitting posture with visual attention, classroom motor organization for transitions and independent access to learning centers. They have improved learning behaviors of initiation and completion of work, visual tracking and reading as well as performing non-preferred activities. TAAP 2, Providing Opportunities to Learn begins with milestones of visual-gross motor development. Key elements of development are related educational components necessary for learning. The visual processing system is further related to the motor system to provide insight to methods to improve independence. Case Studies and research projects are detailed in stages to indicate therapy and integration with the educational team. As a therapist, educator, or family member, read this book and discover the authentic, effective link to visual processing through the gross system that enhances learning.